Nail art tutorial time! I am so happy that a lot of people are trying nail art designs nowadays and I tend to smile when I see random people having cute designs done on their nails! I guess, it's just that, I came to realize how different a person could be, there will always be some similar interests which makes the world such a wonderful place to live in! Since I was a bit in a hurry to do my nail art for the week, I've decided to make it as fun, quick and easy! To protect your nails from all the chemicals, apply your choice of base coat prior to nail polish application. As of the moment, I am using the ZOYA Base Coat which is my favorite! Next, paint your nails with a white colored polish to make your nails appear more vibrant. I applied 1 coat of Orly Nail Lacquer in Daylight. Let dry. Here's a nice way to prevent messy "stamping", I used a tape and covered the sides of my nails as shown on photo below. Pull out your cosmetic sponge (any) and pick out the shades you would want to appear on your nails. I chose Revlon Electric (yellow), Revlon Sassy (green) and Etude House polish in Hot Pink. Sponge these colors in all of your nails. This "stamping" technique is the easiest way to apply 3 colors on each nail at the same time! Quickly apply your choice of quick dry polish to help blend the colors and smooth out the texture instantly. 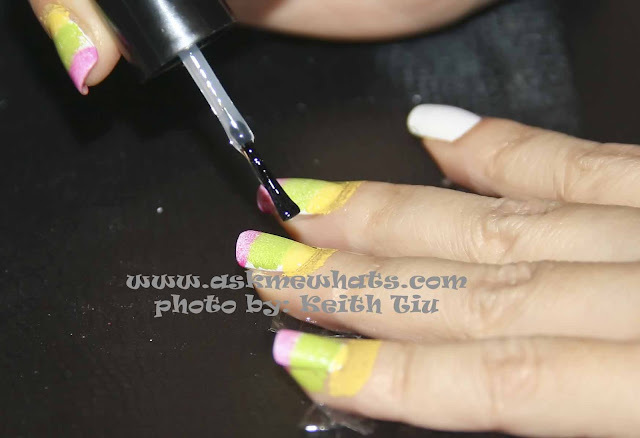 In this tutorial, I used Seche Vite Fast Dry Top Coat. With a cotton bud dipped into polish remover, clean up your nails. You can stop on step 6 and enjoy your tri-colored nails! I want to create a dainty look by adding dots and very simple flowers. I used a dotting tool with Revlon Nail Lacquer in Royal (blue). 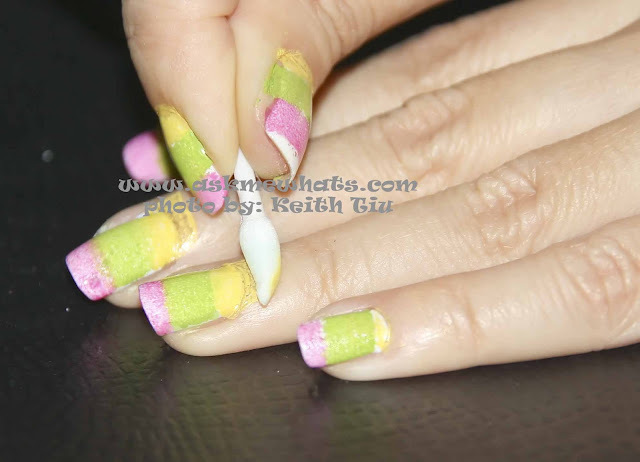 On some parts of the nails that has flowers, you can create petals by using any sharp tip and gently pull the dots inwards as shown on photo below. Apply glittery polish only at the top portion of the nails for a romantic vibe. 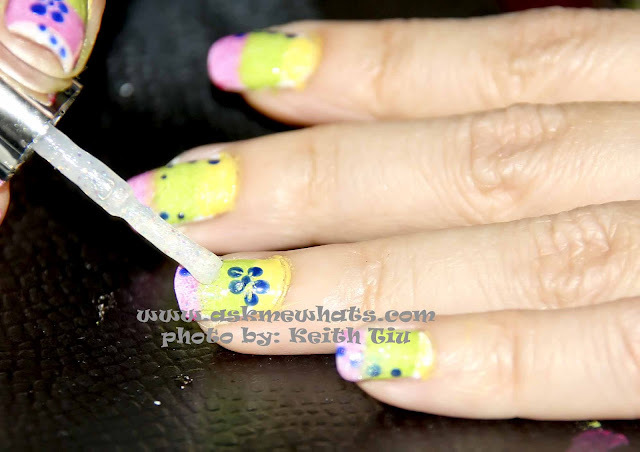 Once the dots and flowers are completely dry, apply a thick layer of Top Coat. I am using The Face Shop top coat. Don't forget to apply even the tips of the nails. This is another optional step, since I planned to read a book immediately, I've applied a thin layer of Seche Vite Fast Dry Top Coat. This is seriously the best Fast Drying top coat I have encountered to date! A sponge method is used to make the color appear more natural and lines won't be too harsh! It's also the easiest way to do gradient / ombre nails! Have you tried using sponge to create gradient effects? Would you give this technique a try? Aww thank you so much for loving my nail art posts! I appreciate it :) Good weekend to you! I agree, it's easy yet the outcome will always be unique!!! You always come out with the cutest designs. This one is very pretty too, well done! Alam mo naman Issa, I'm a sucker for extra steps! I know I should stop sa tricolor pa lang! But I can't help it!!! Love the idea of combining 3 colors in my nails.